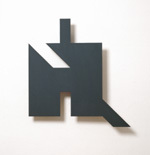 Stankowski was always interested in space and surfaces. He was one of the first to use space and perspective in commercial graphic design. 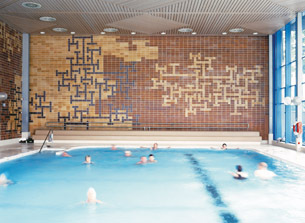 Therefore it is not surprising that he immediately accepted a 1961 commission to design a wall for the swimming pool at the Leuze mineral baths. This wall has been recently renovated and once again shines with a timeless glow. One of his first large public projects was the graphic and artistic design for the Stadthaus Bonn. He created a total design with directional posts (Stankograms), signs, floor numbers, and other informational elements. These directional systems were developed at his studio, Stankowski + Duschek, for many architectural and public projects, among which should be mentioned the complete design for the 11th Olympic Congress in 1981 in Baden-Baden, for which he also designed a large-format sculpture for the square in front of the convention hall. Many of his three-dimensional ideas and designs can be found in his journals. Some of them were designed as cardboard or wooden models, of which only a few still exist, unfortunately. A few important groups of small, serial sculptures were supposed to have been cast in stainless steel at the Viessmann company. He never saw them, however, since they were completed after his death. These sculptures will be on display for the first time. Serial Sculptures and Design in the Public Space.